I need your help. I'm going to a wedding in a couple of weeks. I should say now that this won't be just any wedding, it will be a fabulous wedding, and a fabulous wedding needs a fabulous outfit. I'd like to wear this dress, but need a jacket and shoes to go with it. Despite being know as someone who has an impressive collection of jackets, it still never fails to surprise me when I go to my wardrobe and can't find something quite right. The jacket I'm after has to be quite cropped in order to fit in with the neat waist of the dress. I've found several options, but need your help to decide which one to go for. I could either go with a vintage look, a military look (the red jackets fit into this category), or a contemporary look with a modern print. Here are some of the best I've seen - River Island really came up trumps for me. Coral Paisley jacket, £35 River Island; blue tweed jacket, £60 River Island; wool cardigan with metal cording, £69.99 Zara; cream boucle fluorescent trim jacket, £30 River Island. Super soft cropped jacket, £55 ASOS; collarless linen blend jacket, £75 Jaeger; co-ord embellished cropped jacket, £95 Topshop; lime digital print blazer, £45 River Island. River Island's coral print jacket has the top spot for me at the moment, but I'm worried it's not cropped enough to sit properly with the dress. And in the frame for the shoe option are this silver pair, this cream pair or this silver toe-capped pink pair, all from River Island. Which jacket would you go for? Go vintage with that beaded Topshop jacket - love it! Topshop and cream shoes. Also think coral poss not cropped enough. I agree with the previous post: the Top Shop vintage jacket is lovely, and it complements the dress (and I think it'll suit you better than the coral one). 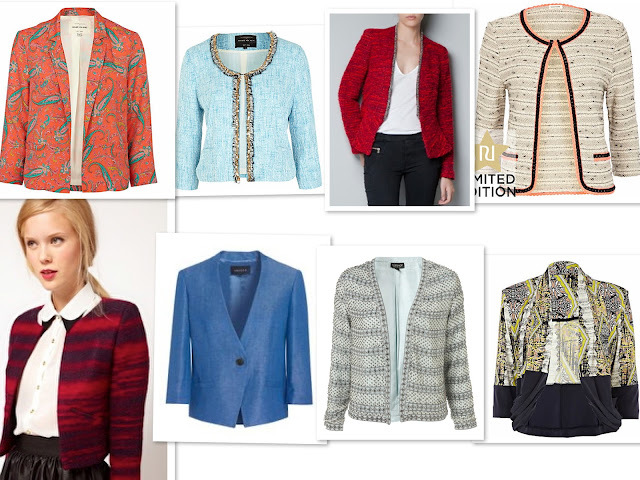 2nd choice is the blue tweed jacket with the beaded trim, but wear it open and not fastened. With either option it should be the silver, strappy shoes: neutral colour but such a FABULOUS style. You'd always add something to any outfit when wearing them (think jeans and a sparkly top, a pretty dress or even a tuxedo-style suit). In addition, to add to the what-to-wear debate, I think that you may need a long necklace of some kind with this dress otherwise, when you take the jacket off at the reception (assuming you're warm/dancing) it'll lack any detail. I'm thinking a mix of delicate, sparkly chains and beads of differing lengths. I'm sure whatever you opt for will look suitably fab!